Serene and sophisticated, this luxurious duvet set is reactive-printed on 100per cent cotton sateen with a 200-thread count and has button fastenings. 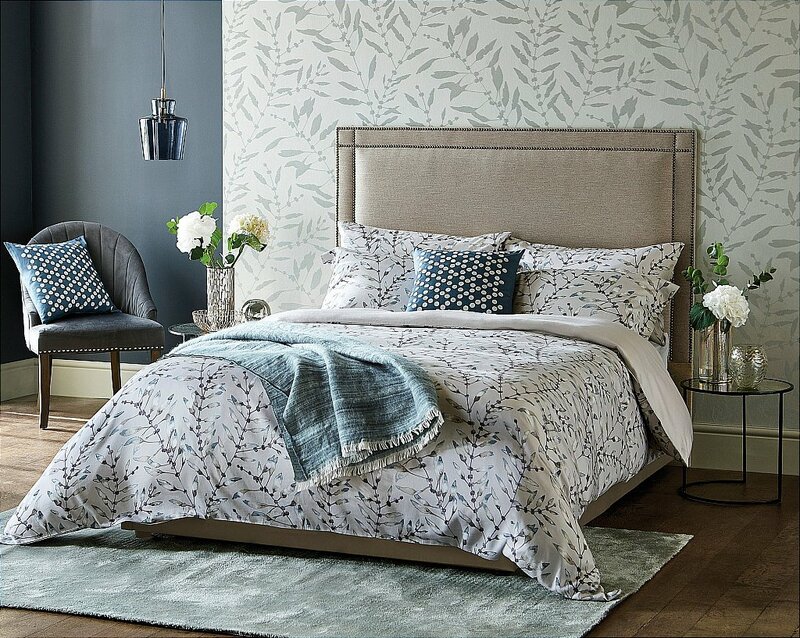 The duvet displays a delicate all-over leaf trail in watercolour blues on a soft grey ground, with the reverse in plain grey. The same motif continues onto the Oxford pillowcases. Complement the look with a sumptuously appliqued cushion which is adorned with silver grey circles on an indigo ground, with a plain reverse. The co-ordinating woven thrown has a delicate striped pattern. Composition: 100 per cent Cotton Sateen. Cushion: 100 per cent Cotton. Throw: 48 per cent acrylic / 43 per cent cotton / 9 per cent polyester. I would like more information about Chaconia Bedding In Indigo by Harlequin.